Over Memorial Day weekend there was huge sales going on at many of my favorite websites. So I took advantage of that and got some of the things I had been eyeing for a little while. It was just after Mothers day as well so my husband added a little something in as a gift which was so very sweet and also very exciting for me since it was one I've wanted for ages. I was obviously thrilled when the boxes began arriving. There was so many things included so I decided to split the post and video into 2 parts. There were also 2 items that I didn't receive till a while later so they will be included in a haul post/video in the future. All of this shopping was done at drugstore.com, beauty.com and bathandbodyworks.com. 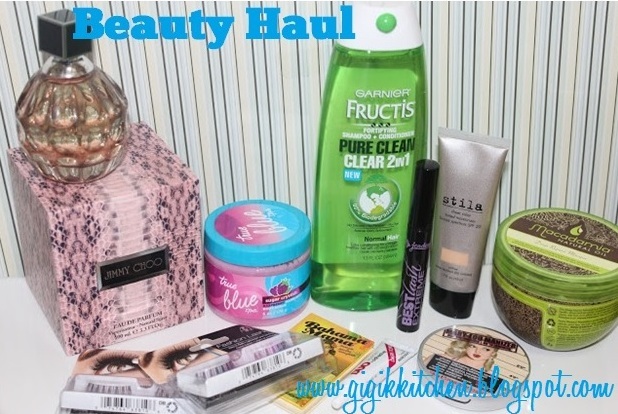 What is your favorite website to shop at for beauty related items? I'd love to know, so leave it in the comments form below- I absolutely love to hear from you! Market Peach,Watermelon Lemonade, Caribbaen Escape and Bahama Fizz 3 Wick Candles - Whenever bath and body works has a huge sale (not often enough!) I make sure to stock up on their 3 wick candles because I love burning them all year long. Until now I had several wintery candles so I chose to go with some that were a little more summery this time. They all smell so good and I have been burning them constantly eve since they arrived. My favorite of the ones I got here is the Watermelon Lemonade one but they are all really fantastic. 3 Pack Pocket Bac Sanitizers- Pink Lemonade, Pink Champagne, Pink Frosting- My sister introduced these to me a little while back so when I saw a good deal on them I chose these three. They leave your hands perfectly clean, smelling great and even leave a slight shimmer behind. I think they are the best things for keeping in a purse and pulling out on any occasion. True Blue Spa Sugar Crystals Raspberry Body Scrub- I love using scrubs in the summer especially on my legs and arms where I self tan. It keeps dead skin away and evens my tan out leaving me with a perfect glow. This one smells really great too. Jimmy Choo Perfume- This is something I have been eyeing for ages in fact I even added it to one of my wish list posts a little while ago. It has such a lovely scent that I think suits me very well and the packaging is just gorgeous! My husband so kindly offered to get it for me as a Mothers Day Gift and I think that was so sweet! It may just be one of my favorite gifts I have ever received. Jordana Best Lash Extreme Volumizing Mascara- I have read some amazing reviews on this mascara and after having then seen it in action looking pretty great I decided I needed to have one- the best part was that it was less then $3. I do love how it looks on my lashes. I will have a full review on it soon. Duo Lash Glue Dark Tone- This is my most used lash glue for myself and my clients both. I ran out of the one in my makeup artists kit and therefore needed to purchase a new one. I go for the dark tone which makes the lashes look even darker and doesn't require as much eyeliner to be used in covering the band. Ardell Wispies Lashes- These specific lashes are some of my favorites for adding length and volume to natural lashes without looking totally fake. I purchase a couple of pairs every time I see them on sale since I can never have too many. Garnier Fructis Pure Clean Shampoo+Conditioner- I have very dry hair in the summer time and so I use some very moisturizing hair care products. Between everything I use on my hair I end up with a lot of gross build up and my hair feels weighed down from it all. That is where a great clarifying shampoo comes in and I've been using this one once a week to remove all of that extra build up and give my hair a really good clean. Macadamia Natural Oil Deep Repair Masque- This is another hair care product I purchased to help with my dry hair after hearing some great things about it. I like to use this once a week too since it gives my hair some much needed moisture and leaves it feeling soft and luscious. I will not buy the tub again in the future though instead I plan to buy the squeeze out tube as this is just a huge mess. Stila Sheer Color Tinted Moisturizer- In the summertime I like to use light face products like tinted moisturizers, bb creams and very light foundations (Mac Face and Body Foundation). I had never purchased anything from Stila surprisingly and after reading some good things about it I decided it would be worth a try. I will update you with a full review once I get an idea of what I think of it. The Balm Bahama Mama Matte Bronzer- This is going to be one of my go to bronzers for this Summer. I can already tell since it reminds me so much of Nars Laguna in it's texture and color. I like that the compact is small but it still comes with a mirror. The Balm Mary Loumanizer- This highlighter is the best one I have found in a very long time. It is super pigmented, not overly shimmery on my cheeks and stays on all day. I am super impressed with the Balm already and look forward to trying some more of their products in the near future.